[1.2.4] AtmosMobs Mod v0.4 - Torch-loving Moth mob added. 6 mobs now! My first mod and mob! Dont be to harsh on this little guy and remember: it's a WIP. I made it so it spawns in Swamps, Forests and Jungles. However it's not a very common spawn...at least not in my game. If you guys get an overload of Chameleonsm, please tell me. It spawns in daytime on grass blocks...just as farm animals actually. Not anymore. You might get a baby by throwing the Chameleon Egg though. Does it do anything special besides being there? It changes color depending on which block it stands! If it doesn't recognise the block as a generated (natural) material then it will change to it's original color. You can make a Chameleon follow you by holding a Spider Eye! It should drop Slimeballs on death but it actually lays Chameleon eggs like chicken when alive! Although they do it more often than chickens. Is there a new drop involved? As I said: it lays Chameleon eggs...so yes there is a new item! It's throwable like a normall egg and has a small chance of spawning a baby Chameleon! (Just as a normall egg with a baby chicken). What does the baby Chameleon do? Exactly what blocks make the tamed chameleon change it's color? - Removed matingAI from Chameleons but still need to fix wheat problemm. - Re-added the matingAI to prevent wheat problemm. - Chameleons now make silverfish sounds but only rarely. - Removed desert biome spawning. - Add more camo textures. - Make them attack bugs. Second mob! Large groups nibble your feet! I made it so it spawns in Jungles and Rivers only in the water! So it won't anoy you when sailing the seas! Any time of day, I think. Yes, when the player enters the water it attacks. It swims and attacks players. It wiggles it's fin and noms around as he moves xD They 'drown' on land. - Fixed them not being able to hit you while in shallow water. - Reduced damage they do to players dramaticly. - Added river biome as spawn area. - They now spawn in bigger groups. - Make it so they also HIT other mobs. They do attack them but seem to have the not-hit-while-in-shallow-water problemm. On beaches and around rivers. Daytime only on grass and sand blocks. No, but it uses it's hurts you when you touch it . It flees from the player just like ocelots. No way to tame it YET. They won't drown in water. - They act all weird when in the water. - Crabs now make silverfish sounds but only rarely. - They are somewhat slower. - Make them drop a unique item so chasing them is worth it. Fourth Mob! 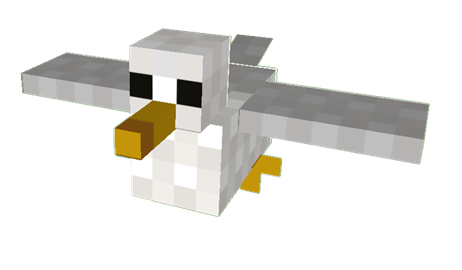 A fast mob that flies around randomly in the swamps! Daytime only and on grass. - When around water they fly up to prevent them from going underwater but they still occasionally go in. However they are then forced to go out very quickly. Daytime only and on sand. Slimeballs I think, need to chang that. Sixth mob! It took me my entire sunday to make but it's finally there! Enjoy! They fly around and are attracted to torches when they are near them. I finally combined the mobs into one mod! Version 0.4 of Atmosmobs is available for Mc 1.2.4.
first it looks cool man ! why dont you make a tank/habitat block, craft from glass and store your chameleon in there by right clicking the chameleon (picking it up) and then right clicking the tank (place in tank) with the chameleon in hand. make the tank/habitat 2x2 blocks big. what u think? Haha Thanks! Wow you have some good ideas but this is my first mod xD So Im not that pro yet! Thanks for the feedback though. They look great! I concur with your statement that they are cute. Moving on to obsidianCore's Idea, if they ran like ocelots, they would either have to be slower, so that you could actually catch them, or be too tempted by the thought of a spider eye to run away. Or both! Having the option not to bait the little guy could be quite a bit of fun as you chased him back and forth. Sweet. Good luck in the future with the mod, Davey. Awesome man!!! Make climeable so it can climb trees and make fly mob that chameleon can eat! New mobs added! There are some bugs and problemm but those arent noticable when playing. Enjoy the crabs and piranhas! Yeh, I didnt even know how that happened....you saw that the links didnt match each other :/ Well it should be fixed now. Howabout a whale? A humpback whale? Your amazing at making mobs, they are great! This looks awesome! May I suggest moths that huddle around light-sources? Could you make dragonflies drop nether warts? - Spawns on water blocks. - Makes the seagull sounds we all love so much when going to the coast irl. Special Behaviour:When doing the eating animation and a seagull is near, the seagull will charge for you and steal your food. - Only appears at night. - Makes the 'hoot' sounds to create a great atmosphere at night. Special Behaviour:Attacks mobs smaller than it, so you would actually need Mo'Creatures to get it to attack mice. - They are somewhat rare as they could get annoying. Special Behaviour:Sits on the side of a log and 'pecks' into the log, making the ticking sounds. - Spawns on murky water. Special Behaviour:When the water is only one block deep it will walk over the bottom with it's long legs. - Spawns on a great height. - Flies at a great height making the echoed eagle sounds. Special AI:Attacks all farm animals and even you when you get to close! - Spawns on sand (duh). Special Behaviour:Stays near player and attacks when the player has less than 3 hearts. Special Behaviour:Eats all tall grass on it's path. Special Behaviour:They swim very fast and aren't effected by the slippy ice. 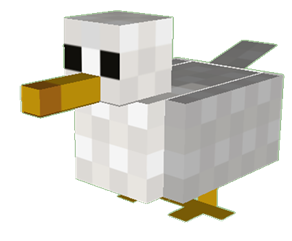 Why do you have models of these mobs if this is a IDEA? Were you planing on making a mod with these mobs? Oh and some more suggestions.